Breed, raise and collect over 300 real life butterfly species as you expand and design your beautiful rainforest! Challenge yourself and your friends to discover and collect the huge range of real world butterfly species. Be the florist design master of your very own butterfly forest sanctuary. Expand your forest with beautiful colours, plant special flowers to attract new species and feed your butterflies pollen. Every month you’ll be challenged to collect a limited set of brand new butterflies. Listen to the Rainforest in the palm of your hand - Experience the realistic lush nature ambience and find relaxation in a calming world of wonder! The “splashcam” feature in Runaway’s other game “Splash: Underwater Sanctuary” requires read/write external storage permissions, in order to save in game screenshots taken by players to their devices. Flutter is built with the same underlying platform technology base, therefore Flutter also requires these permissions although they are not currently being used in the game. - We've got a great update lined up for all our Flutter fanatics. - A hugely anticipated feature is finally here... You can now have even more butterflies in your forest! - Spend Honeydew to expand your maximum population and fill your forest with more of your favourite fluttery friends! 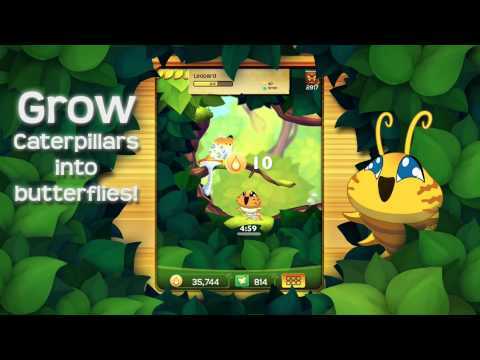 - Raise eggs, caterpillars and pupa even faster with the new video-hurrying feature. - Check out the all new redesigned shelf menu, with special incentives for playing our other titles. - It's that loving time of year once again in the Flutter forest as Valentine's Day arrives. - Express your love to your friends, family, or special someone by sending Valentine's gifts in game! - Collect the new Valentines set of butterflies, including the stunning Euphaedra Charaxes. - A mysterious wind has carried a flurry of rose petals into the forest. Love is literally in the air! - Collect the Valentine's themed 'Passion Parcel' IAP for a special discounted price. - We're doing something very special to celebrate our wonderful community this month. An entirely fan-chosen event! - The all new Civitas butterflies and decorations have all been suggested to the Flutter team by our amazing fans (That's you!). - Collect this special set of your favourite butterflies, share and celebrate with your fellow players! - The 'Community Carton' IAP available during the event features the Yellow Pitcher Plant decoration, A player-favourite! - The forest is brimming with festive cheer this holiday season! - Collect the new Aurora set of frosty blue butterflies, in your Christmas-themed forest. - The forest is blanketed in snow...Snowball fight! Brand new (limited time!) minigame lets you sling snowballs to knock down snowmen. - Grab the limited time "Snowday Special" IAP containing the Douglas Fir decoration. - A never-before-seen festival comes to the Flutter forest with this update. Diwali! - Unlock an all new set of butterflies in the Mehndi event to celebrate the festival of lights! - Brand new forest background and theming! Watch the sun dip below the horizon and the forest light up with candles and fireworks! - See the forest adorned with traditional Diwali decorations and diyas (traditional lamps). - Check out the limited time "Diwali Deal" IAP, containing the Indian Persimmon decoration! - The Double Ninth festival is happening in China this month! - We've prepared a selection of Asian butterflies, including the unique teardrop shaped Chinese Windmill butterfly! - Grab a "Juhua Jewel Box" containing a Chrysanthemum decoration! - Once a year, in the tiny town of Bunol in Spain, there is a huge tomato fight! - For one hour, some 20,000+ people throw some 100+ tons of tomatoes at each other. - You too can throw tomatoes at targets in-game for a set of special prizes! - In honour of this equal parts ridiculous / fun festival, we're having a tomato themed set of butterflies! - Buy yourself a "tomaTOTE" a limited time only shop pack containing (you guessed it) a tomato flower! - It's a big month for Butterflies in Europe this month with the start of the annual Big Butterfly Count! - If you live in the UK and want to help, visit butterfly-conservation.org to learn more! - We've decided to help promote the event by having our own European butterfly set! - Help nurture your baby butts with a nettle! (no really, nettles make excellent butterfly nurseries) Available from the Butterfly Bundle! - Celebrate the holiday with the Stars and Stripes themed Majesty set of butterflies! - Watch the butterflies fly in formation over the forest as petals rain down on every successful summon! - See this amazing Texas Bluebonnet? It's available as part of the Freedom Pack this Independence Day! - Beautiful Independence day environment theming and updates! - Summer is here! Celebrate the sunny season with a beautiful new set of summer butterflies arriving in your forest! - A special Blue-breasted Kingfisher is visiting the forest for a limited time! - Environment theming has been updated for Summer - check out the glorious sun rays blasting out of that summer sun, plus tropical Hibiscus and Gazania flowers. - Summer Sale pack! Loaded with unseasonably good deals, including the classic Lavender decoration. - It's a special Earth Day update - we're taking the message of ending plastic pollution into Flutter! - Oh no! Plastic is littering your forest! Help clean it up with the help of the Arbor set of butterflies. - Each species of butterfly from the new Arbor set that is perfected during the event will help clean up one piece of your forest. - The new Arbor set of butterflies is from all over the world, reflecting how environmentalism is a global issue. - Egg hunt! Enjoy the fun of Easter and hunt for eggs hidden around your forest every day!- Welcome a beautiful new Easter themed set of butterflies - these species are colored like painted Easter eggs!- Adorable 'bunny ears' costumes for all caterpillars!- Check out the Pontic Azalea available in the Easter basket special shop pack! - Celebrate Chinese New Year and year of the Earth Dog with this special update!- In-game news posts themed around the characteristics of those born in Year of the Dog- Receive hóngbāo (red envelopes) in your forest throughout the event!- Featuring a brand new environment to honor the Chinese New Year, showing the beautiful mountains of Guilin- Pick up a IAP special Prosperity Parcel featuring the Rock's Tree Peony! - Aw mate! We have a ripper event in Flutter coming up for all the blokes and sheilas in the land down under!- Bust out the esky and chill with the brand new, 100% Aussie outback set of butterflies arriving in your forest!- We didn't manage to get in drop bears or bin chickens, but there are plenty of boomerangs!- Beautiful new Aussie Kookaburra plumage for the mission bird!- Spend your dollarydoos on the dollary-deal IAP special featuring the Waratah decoration! - Get merry with Mama Wispmas who is visiting your forest!- A brand new Icicle set of Christmas themed butterflies have arrived!- It's snowing in your forest! Special Christmas themed environment!- Gifts received in game will appear under a new Christmas tree! Don't open them all at once!- Christmas Frosty Favour IAP! - Halloween is almost here and we have a spooky new set of butterflies for you!- Dios mío! Learn the spooky South American story of El Tunchi, defender of the rainforest!- Send a chill down your spine with rain and lightning added to the forest!- Brand new email system: get behind the scenes info and earn rewards! - Autumn is here, bringing falling leaves, pumpkin spice, and the Autumn set of butterflies!- Fyber overhaul, watch incentivised videos for better rewards!- The forest is changing color! For this event only, experience the game in the warm, earthy tones of the season.- Sneezeweed decoration and pumpkins galore in the Autumn IAP pack! - Enjoy a beautiful new scene in your forest, with the setting sun and vibrant rainbows as Summer draws to a close- Touch system overhaul- Unique environment theming and a brand new set of colourful butterflies available- End of Summer special IAP sale pack! - YEE HAW It's Independence day!- Celebrate with a brand new set of red white and blue butterflies, feat. the Uncle Sam day flying moth!- Amazing decorations incl. fireworks bursting from the incubator with every successful summon!- Special Independence Day IAP sale pack! - In-game calendar. See upcoming events, weekend bonuses, and sales. Get rewards for logging in every day.- Beetle Bank. Earn a small amount of Flutterbucks for logging in every day!- Escolha event: A new set of butterflies to collect chosen by the community.